Kitchen cupboard doors (currently white-painted varnished wood from the 50s ) are decorated with patterns produced using the technique of painting with stencils. I based my patterns on Indian cashmere wool fabric designs:stylized flowers and birds. I used tracing paper and white bristol board for the drawing and the stencil. 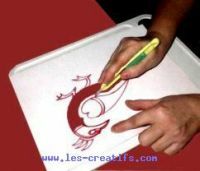 To paint, you need a medium stencil brush and acrylic paint in a tube ( red, yellow, blue ) mixed on a palette to produce some warm shades of color. I cut the patterns out using a craft knife. I used the same motifs over and over again, positioning them alternately in a symmetrical fashion, thus creating a kind of aesthetic balance. The motifs are made up of solid blocks separated by "gaps" around 0.4 inches wide. 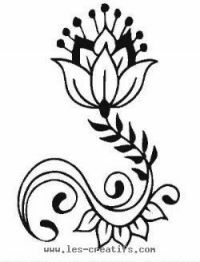 The designs are based upon traditional Indian motifs because I love the whole Bollywood ambience! 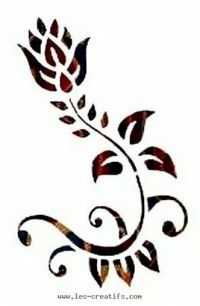 The Indian flower design has been adapted for use with the stencil. 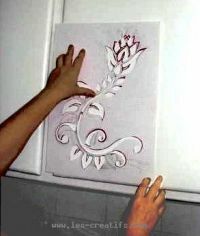 Reusing the stencils to create a design for a large door that matches the cupboard.